Last week I had the honor of attending the retirement ceremony of Mrs. Mary Estrada, a Navy Government Service Employee and a close friend. 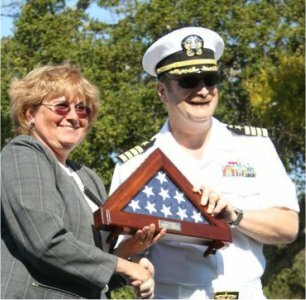 Mary is a Navy veteran and one of the forces behind the web services at Fleet Numerical Meteorology and Oceanography Center, the Navy’s world class atmospheric modeling center. She is probably most famous for her work with the Optimum Path Aircraft Routing System – more commonly known as OPARS – the product that military pilots of all services use to determine the best routes to fly to save fuel and time. Over the lifetime of OPARS, it will have saved about a quarter BILLION dollars in avoided costs. It is a remarkable piece of software, but as it is with anything in the military, there are dedicated people behind it that deserve the credit. Mary is one of those people. She put three decades of toil and sweat into OPARS, and the product reflects that dedication. Her ceremony was emotional and inspiring, and it ended with one of the best walk-offs I have ever seen. You see, Mary is not only a Navy veteran and software genius, she is also an American Legion Rider. You have seen the Riders standing guard along the road during military funerals. They are as patriotic as they are tough. 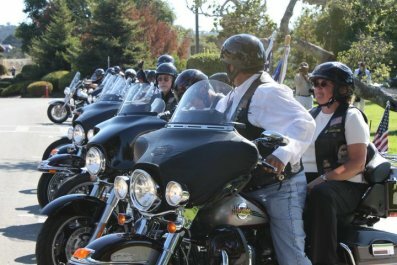 Mary is the American Legion Riders’ State Chaplain for the entire state of California, and she was accompanied by about twenty of her biker compatriots at her retirement. At the end of the ceremony, she walked through the traditional bullets, took off her suit coat, put on a Harley vest, and climbed onto the back of her husband’s bike. “Anchors Aweigh” played for a while, then the music faded out. Suddenly, “Born To Be Wild” blared out over the speakers. Simultaneously the bikes all started at once, and as a group they rode off, leaving the rest of us to watch and marvel. Great exit for a great career, Mary. Thanks for your friendship, your dedication, and your continuing service to our country. You are our hero of the week.